Aberdeen rounded off their Europa League preparations with an accomplished 1-1 draw against West Brom at Pittodrie last night. Sam Cosgrove broke the deadlock on 37 minutes with a well-placed header before Jake Livermore levelled for the Baggies. While the away side dictated the play for large facets, the Dons remained defensively solid and probed away at the West Brom defence. Mikey Devlin recovered from a groin injury to start, which will have been a relief to Derek McInnes given his paucity of fit defenders. New addition Dominic Ball was given a runout in central midfield, while trialist Krystian Nowak was again on the bench. The Baggies included England caps Kieran Gibbs and Jake Livermore in their line-up, as well as Chris Brunt and Matt Phillips, internationals with Northern Ireland and Scotland. Scot Oliver Burke was among the substitutes. This game would give McInnes his best chance to assess how the Dons will fare against Burnley, given the similarities between their styles of play. Promisingly, they threatened within the first minute through Cosgrove, who won his duel with Jack Fitzwater on the left flank and drove for goal, where he found Kyle Bartley in his way. West Brom were content to retain possession without probing too much, with their first clear opportunity coming after clever work from Brunt to set up youngster Kyle Edwards, with Graeme Shinnie intervening to prevent a shot on target. The first period was a largely low-key affair although the Dons impressed in spells. Lewis Ferguson briefly raised spirits around Pittodrie by attempting to chip Jonathan Bond from inside his own half but landed his effort on the roof of the net before Cosgrove was harshly adjudged offside from Scott Wright’s cross. Cosgrove has toiled without reward so far in his Aberdeen career but took his goal very well eight minutes before the break. Gary Mackay-Steven beat Martin Cranie to the byeline and whipped the ball into the box where Cosgrove, getting ahead of Bartley, directed his header across Bond into the far corner. Darren Moore, a former team-mate of McInnes at the Hawthorns, will have felt aggrieved at going behind but the lead lasted just four minutes. Rodriguez got the beating of McKenna easily before Devlin intervened, with the ball breaking into Edwards’s path. Joe Lewis did brilliantly to sprawl at the forward’s feet but it left Livermore with a simple tap-in. With three changes made at half-time the English side started sloppily, with their reshaped defence losing possession cheaply and conceding opportunities from set-pieces. McKenna had a header wide wide from Forrester’s free kick and Ferguson put another over from a half-cleared corner, as the Dons sought a second goal. Devlin, who had a relatively accomplished evening alongside McKenna in subduing Rodriguez, was next to chance his luck from a set-piece, heading over when well-placed from Mackay-Steven’s corner. The introduction of Rekeem Harper for the Baggies provided a different dimension for the Dons to deal with, as the 18-year-old drove from the centre of midfield with pace and the ability to skip past a number of challenges. 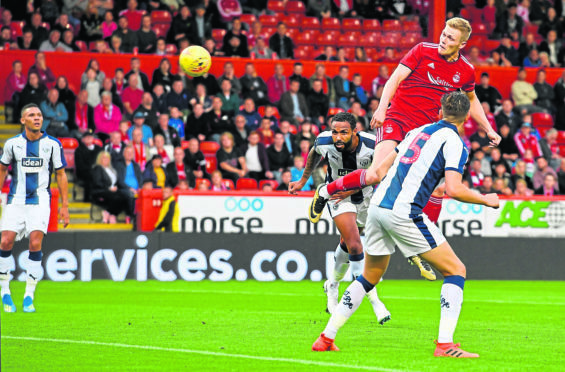 Ferguson’s willingness to assert himself in both defensive and attacking situations will have impressed McInnes, given his relative inexperience, and Cosgrove’s hold-up play was vital as the hosts tried to play off second balls. While only a friendly, it will have been a worthwhile exercise in gauging the pace of the game against English opposition and how the Dons can attack defensively-organised sides. Aberdeen (4-3-3) – Lewis; Logan, Devlin (Nowak 66), McKenna, Shinnie, Ball (Campbell 78), Ferguson (McLennan 88), Forrester (Gleeson 78), Wright (Anderson 80), Mackay-Steven, Cosgrove (May 66). Subs not used – Craddock, Harrington, Roscoe, Antoniazzi. West Brom (4-2-3-1) – Bond (Palmer 64); Cranie (Hegazi 69), Bartley (Wilson 46), Fitzwater, Gibbs (Melbourne 46), Field (Morrison 64), Livermore (Harper 46), Phillips (Burke 64), Edwards, Brunt (Leko 69), Rodriguez (Robson-Kanu 64). Subs not used – Dawson.